Arena Financing $20 million by the Hurricanes, $22 million ($48 million financing by hotel tax) by Wake County and the City of Raleigh, $22 million by NC State, $18 million by State of North Carolina. Naming Rights Royal Bank of Canada paid $80 million for 20-year naming rights. PNC Financial Services Group acquires Raleigh-based RBC Bank which previously owned the rights. 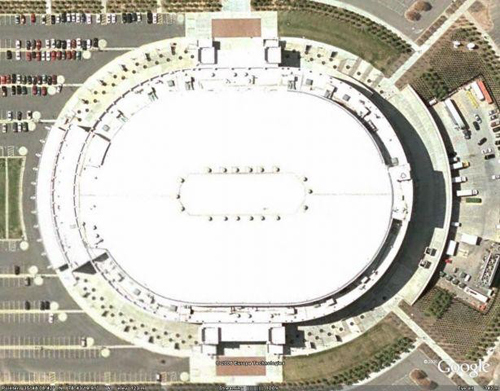 Arena Architects Odell Associates, Inc.
1997-1999 - Attendance for Greensboro Coliseum, Greensboro, NC. RALEIGH -- Professional hockey is coming to North Carolina this season playing in Greensboro before moving permanently to Raleigh. The Centennial Authority, in charge of raising money for and building a new $120 million arena, approved the outline of a proposed 20-year lease agreement with the Hartford Whalers, likely to be renamed the Carolina Hurricanes. The lease would give the NHL team control over the arena's day-to-day operations. The Centennial Authority took the action about an hour before Raleigh officials formally announced that the Whalers were relocating to Raleigh. The lease agreement calls for the team to contribute $12 million to the arena's cost. The arena would open in 1999, with construction set to begin in about three weeks. The Centennial Authority approved the proposed lease 11-1 after a closed-door meeting. Voting against the agreement was businessman and NCSU supporter Wendell Murphy. Murphy said he felt the building should be controlled entirely by the Centennial Authority. The agreement permits the Whalers to hire concessionaires, with the authority's approval, and to control the arena's day-to-day operations. However, North Carolina State University, which would share the venue with the Hurricanes, would have priority in selecting playing dates at the arena under the proposed lease. NC State also would have the first crack at naming the arena under the lease, but the authority agreed to discuss naming rights in more detail later. Karmanos was expected to sign a memorandum of understanding regarding the lease later today, but the lease itself -- expected to run over 100 pages -- will be drafted between now and July 1. At Tuesday's press conference, Karmanos said the lowest priced seats to pro hockey games in the Triangle would be "probably $20." Asked about the proposed team name, Karmanos said the decision was "easy." "It was between the Hurricanes and Ice Dogs," he said. He added the team's jersey's would be "traditional." "I'll guarantee you it won't be teal," Karmanos said, referring to the team colors of the Charlotte Hornets. But before the Whalers bring their pucks and sticks down south, there are a couple of hurdles to clear. The Whalers must pay Connecticut $20 million to end their lease agreement a year earlier than scheduled. If the Whalers stay in Hartford another season, they would have to pay only $5 million to leave. State House Speaker Thomas Ritter has proposed boosting the early exit fee to $40 million. If the Connecticut Development Authority wants to charge Karmanos $40 million to leave, the Whalers likely will play one more season in Hartford before coming to North Carolina next season. Gov. John G. Rowland has called a meeting of the Connecticut Development Authority for 4 p.m. today in Rocky Hill, Conn.
Dean Pagani, the governor's spokesman, confirmed that. "The governor thinks this has gone on long enough," Pagani said. "There is no reason to think we can get more than $20.5 million. This could have been done at the last scheduled meeting in April. The governor has been holding back in deference to [House Speaker Thomas D.] Ritter." Rowland, despite a call by Ritter to double the fee, has maintained in recent weeks that the agreement would be ratified as negotiated. Also, the Hurricanes are still working on a financial settlement with the minor league Carolina Monarchs, the current tenant at the Greensboro Coliseum. Greensboro will play host to the Carolinas' new NHL team while the new Entertainment and Sports Arena is completed in Raleigh. Karmanos, who purchased the Whalers in 1994, announced in late March he would leave Connecticut when negotiations between government officials failed to reach an acceptable deal on a new Hartford arena. The Whalers began play in 1972 in the now-defunct World Hockey Association and joined the National Hockey League in 1979. They have had 15 losing seasons in 18 years of play in Hartford, and have most more than $15 million a year in recent years of play. 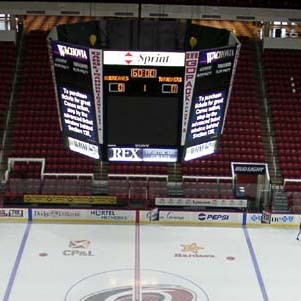 The lease between the Hurricanes and the Centennial Authority would span the 20 years following the Raleigh arena's opening in 1999. It also contains two five-year renewal options. The proposal calls for the Whalers to pay $3 million a year rent for the first three years and then 6 percent of gross revenues in the years following, up to $55 million. The Whalers would pay the city 3 percent of any revenues collected above $55 million. Whalers' general manager Rutherford says that he eventually wants the entire region involved with Raleigh's new hockey team. The big plans include the NHL team in Raleigh, possibly named the Carolina Hurricanes, the American Hockey League affiliate in Greensboro, and the East Coast Hockey League affiliate in Fayetteville. Contractors in Raleigh say they can complete the city's new arena on time for this fall's planned opening, but only if they have and additional $6.4 million. If approved, the extra cost could push the price over $170 million. The arena will be the home of the NHL Hurricanes and the University of North Carolina. Arena construction officials said they will review the request and determine whether it should be paid. The contractor is obligated to open the venue in September, regardless of the extra cost. Its contract imposes a $10,000 daily penalty for not opening by Sept. 1. The Centennial Authority, which oversees construction, has only $7.5 million left in its contingency budget. The city and Wake County in September approved the release of $5.2 million from a bond payment fund to help the authority deal with mounting expenses. The Authority may borrow up to $4.5 million if needed to deal with extra costs. Authority members are concerned they will need to spend more money to bring the over-budget project in on time to avoid lawsuits. The loan from Centura Bank reportedly carries an interest rate of 8.5%, higher than most governments now pay. The bank also wants a first lien on the arena. It will be at least October before Raleigh's new Sports and Entertainment Arena opens, but the Carolina Hurricanes have given 2,000 select guests a tour of the venue. The Hurricanes said the arena will be open for business Oct. 29 for the NHL team's opener. The heavy construction is complete and crews are now doing finish work such as installing seats, drywall and completing luxury suites and arena facilities. All but four of the venue's 61 luxury suites have been leased, including ones sold to players Ron Francis and Glen Wesley. An exclusive advertising contract between the Carolina Hurricanes and Anheuser-Busch has other beer distributors concerned that they won't get equal taps in the team's new arena. The battle will end up before state regulators where the team has asked for an exception to a law that prohibits holders of liquor licenses from taking payments from brewers. The North Carolina Beer and Wine Wholesalers are asking regulators to deny the exception. The Hurricanes' contract gives Bud Light prominent space in the arena, including on the ice. The wholesalers say an exception would create the kind of unhealthy competition the law was intended to prevent. The team says the advertising agreement and the liquor sales agreement are separate deals and pose no conflict. The team says it will use independent research on local beer sales to determine how to allocate the available taps. The research shows Busch has about 50% of the market. The rest of the taps will go to Miller, Coors and others who divide the remaining 50%. * Architect - Odell Associates, Inc.
* Contractors: Hensel Phelps Construction; Aneco, Inc.; John J. Kirlin, Inc.
North Carolina's Alcoholic Beverage Control Commission has rejected an advertising plan between the Carolina Hurricanes and Anheuser-Busch saying it violates a law that prevents brewers from paying money back to those who sell their products. The team had asked for an exception to the law, saying the venue advertising contract was separate from concession contract. The exception was opposed by the North Carolina Beer and Wine Wholesalers Association and Miller Brewing Co. The deal would have put the logos in the ice and in other locations around the new arena that opens this fall. The company would have been the exclusive beer advertiser. The Hurricanes, who will also operate the arena, are exploring options, including hiring an outside concessionaire. By using another company, the team could distance itself from the liquor operation. It would also reduce the profit the team gets from all concession sales. The team did not say what the advertising deal was worth, but indicated it was for three years and not a "multi-million-dollar deal." North Carolina State University has rejected the 19,722 burgundy seats installed in the new Sports and Entertainment Arena in Raleigh and has told the Centennial Authority overseeing construction that it has breached its contract with the school. Under the university's agreement with the Authority, the seats are to be Wolfpack red. The Authority is withholding $1.5 million in payments to the Carolina Hurricanes, who will also reside in the arena and which ordered the seats. The team has been told to work out a settlement with the university. The venue is scheduled to open Oct. 29. The Hurricanes say NCSU officials approved the colors before the seats were ordered and that it would cost $611,000 to replace the seat cushions. The Carolina Hurricanes are poised to sell naming rights to their new arena that opens this fall in Raleigh for up to $60 million if the team can work out a deal with North Carolina State University which shares the venue. As originally planned, the arena would have hosted the university's basketball team, but plans for the venue changed when the Hartford Whalers reached a deal to move to Raleigh. The university had naming rights to the arena and had committed them to alumnus Wendell Murphy who made a donation of up to $10 million to the school. School officials indicate they are willing to give up the rights for $10 million and a share of the total final sale above the $10 million. Team officials say they aren't willing to give the school more than $10 million. The team must already divide the amount above $10 million with the Centennial Authority, the committee charged with constructing the arena. Under that agreement, the team gets 62% of the amount above $10 million. That poses a problem for at least one potential naming rights suitor, Nortel Networks Corp, which says it won't sign a final deal until the naming rights debate is resolved. Disputes of the past are being forgotten as Raleigh's new Sports and Entertainment Arena prepares for an opening Oct. 29. Money and construction problems are taking a back seat to getting the new venue open for the Carolina Hurricanes and North Carolina State University. Project managers say they expect to meet the deadline. Workers were scrambling this week to replace 5,000 fire sprinklers which were found by inspectors to be of the wrong type. While that delayed inspectors' approval a few days, it's not expected to affect opening day. A public open house is planned for October 27, 1999. Although the public debut of the new Raleigh Entertainment & Sports Arena isn't until Friday, the NHL Hurricanes have begun practice on the new venue's ice. Workers are still cleaning and doing finish work on the venue, but the eight-sided scoreboard and the rest of the arena's facilities are up and running. The Hurricanes came to the area from Hartford, CT in 1998 and played at the Greensboro Coliseum while the new arena was being built. The building was originally designed just for North Carolina State University, but was reworked when the NHL team became a tenant. The changes drove the cost of the 18,550-seat venue up and started rounds of debate over who would pay for the extra costs. The original price was to be $66 million, before the Hurricanes moved to town. The cost is now more than $170 million. The team agreed to pay $20 million more for renovations it needed. Under its agreement, the team will pay $2.75 million in rent the first three years, then $3 million after that. 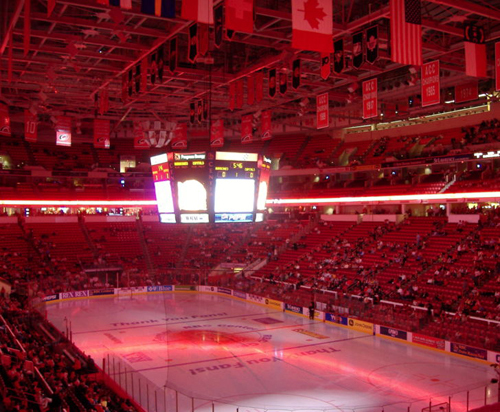 The NHL Hurricanes agreed to provide an additional $5 million when the arena went over budget. The Hurricanes are poised to sell naming rights to their new arena for up to $60 million if the team can work out a deal with North Carolina State University. The university had naming rights to the arena and had committed them to alumnus Wendell Murphy who made a donation of up to $10 million to the school. School officials indicate they are willing to give up the rights for $10 million and a share of the total final sale above the $10 million. Team officials say they aren't willing to give the school more than $10 million. The team must already divide the amount above $10 million with the Centennial Authority, the committee charged with constructing the arena. Under that agreement, the team gets 62% of the amount above $10 million. Most of the seats in the new venue, 11,000 of them, are in the lower bowl. The arena has 73 luxury suites leasing for $100,000 to $140,000 annually and 2,000 club seats leasing for $1,000 a year. The club seats include tickets only for the Hurricanes. Hurricanes owner Peter Karmanos hopes to make a profit his first year in the arena, which the team will also manage. The team expects to take in $70 million during the first year. If average attendance is 14,000 fans, the team will earn $575,000 from parking and $2.3 million from concessions. Advertising is expected to net up to $6 million. The Carolina Hurricanes opened their new arena in Raleigh last Friday with a 4-2 loss to New Jersey. The new Entertainment and Sports Arena opened to a full house and traffic jams around the facility. Fans gave the facility strong reviews and no major problems were reported. The $154 million arena had a difficult birth. It began as a home for North Carolina State University, but evolved when the Hartford Whalers agreed to move to the Triangle. The needs of the NHL team pushed up the cost and funding became a difficult issue, pitting the Centennial Committee charged with construction against local governments. Opening deadlines shifted, but once the Oct. 22 date was set, construction workers got the job done. The venue's luxury suites feature Internet access where fans can access player stats on the team's web site or order food and beverages. On October 18, 2006 Bobby Schultz wrote: The RBC Center is the loudest venue in America. During Game 7 of the Stanley Cup Finals, a reading of 134 decibels was recorded. It is the loudest measurement ever at an American sporting event. January 29, 2001 - This building was conceived as a fieldhouse and new home for the NC State Wolfpack basketball program (The Carolina Cobras of Arena Football also play here). But once it became apparent that this city was going to be home to an NHL team, plans were changed and this facility was upgraded to bring it to league standards. Even though the building is two years old, it remains a work in progress. Raleigh Arena is located about 7 miles west of the city and in proximity to Research Triangle Park, a mammoth area housing some leading pharmaceutical and technical research firms. There is easy access to the facility from the interstate, but this building stands alone and is nowhere near any neighborhoods or adjoining buildings (kind of reminded us of the area surrounding the Corel Centre in Ottawa). Parking is abundant and the building is well lit and landscaped. There are several entrances to the building, and the "main" one consisted of a ticket window area and small lobby. Once you walk into the building, you are immediately impressed at how bright everything is - very white, lots of lighting and red and black accents add to the decor (the Hurricanes and Wolfpack colors are red/white/black). This is a multiple concourse facility. Escalators take you to the upper levels, and there are sweeping views of the outside as you ride upstairs. One unique feature on the first level was a "concourse in a concourse". The sideline seats in the 100s are deemed premium seats and from the main concourse you have to go through a set of doors (and have your ticket checked) to a separate private area with its own concessions and a view of the playing surface. This was designed initially for the Wolfpack and before the idea of a "club level" was conceived. Again, very bright and cheery - all seats are in team colors - wine red. In one end zone of the club level is a "super premium" seating area... each seat has its own video screen with video, internet and email access. 61 suites ring the sidelines in the club level and the corners and end zones of the 100 level. At one end of the club level concourse is a banquet hall and dance floor which also serves up a pre game buffet for club ticket holders only. This area looked rather ordinary and lacked the ambience of our 100 level Harbour Club in Buffalo. Back to the bowl - An 8 sided scoreboard with outstanding video boards hangs above center ice. Ad panels along the balconies are backlit and stationary. The Hurricanes management is still looking to upgrade the building's facilities - in the 100 end zone they are erecting a sports bar with a view of the playing surface. AND --- Management is talking with Daktronics to look into installing a surround LED display board in the Raleigh Arena, and they will be checking out the set up at the XCel Energy Center in St. Paul sometime in the near future. Yet another NHL facility stepping into the 21st Century!!! The food was nothing special, but we have to tip our hat to the name of the Hurricane's team merchandise store. It is called "The Eye". Coolest name in the NHL, eh? An entire crop of banners saluting every accomplishment imaginable for the NC State Wolfpack, which really isn't so unusual for college teams to do. The Hurricanes have but one division title banner hanging. This franchise's signature moments happened in the WHA when they were called the Hartford Whalers. Presumably, those banners still hang in the Mall at Hartford.... and that is where they will stay. Each usher is furnished with a "Stop" sign, which asks people to wait till a break in play before returning to their seats. The ushers seem to like it - beats having to verbally stop fans all night long. As a tribute to the nationalities of each of the Hurricanes players, flags of their respective countries hang in the rafters next to the American and Canadian flags. Nice touch! Is this a college basketball fieldhouse? Or is it an NHL arena? There seems to be a subtle tug of war for the soul of this building. To their credit, the Hurricanes are attacking their daunting challenge on two fronts - first of all, committing significant capital spending to improving this arena and adding amenities which are available in their peer facilities. The Hurricanes management is devoting a lot of effort to researching what works and what looks good in other NHL venues. Second, the team is developing an audience literally from the ground up, working in a market with little hockey tradition and an area where NCAA basketball is the public's passion. From our observations they have already made significant inroads. We wish to thank KEN LEHNER, Carolina Hurricanes Vice President of Marketing Communications, for his hospitality. Ken fixed us up with some terrific seats for the game, and took time from his busy schedule to take us around the facility. Ken formerly worked for Bison Baseball and Rich Products and asked that we say "hi" for him to his old friends and associates in Buffalo. PNC Financial Services CEO James E. Rohr told the Charlotte Observer that the bank is looking at putting its own name on the RBC Center after the acquisition of the firm is completed, which is targeted for next March. PNC announced its acquisition of RBC Bank this week for $3.45 billion. Raleigh's arena has been renamed PNC Arena, the Raleigh News & Observer reported. The switch comes as PNC Financial Services Group acquires Raleigh-based RBC Bank which previously owned the rights. Initial approval came from the Centennial Authority, the arena's owner and developer. The 20-year deal is worth $80 million. The current home of the Carolina Hurricanes officially becomes PNC Arena today. The change comes after RBC was acquired by PNC Financial Services.